What Is a Prescription Benefit Management or PBM? PBM is a Prescription Benefit Manager providing traditional Prescription Benefits Management services as well as 340B, Hospice Care, Rx Advantage Prescription Card to self-funded employee groups, TPA's, hospitals and individuals. PBM has now entered the pharmacy marketing industry alongside a partner compound group to provide a long term and sustainable solution for motivated and “ex” compounding, current, or any other active pharmaceutical reps across the industry, who want to earn top level, compliant compensation promoting approved medications that truly serve a worthy purpose in the marketplace. The PBM is already processing over 1000 prescriptions of FDA approved topical products every day with solid infrastructure in place to process thousands more. What’s The PBM Success Formula? A PBM to facilitate and guarantee payment for large volume of prescriptions nationwide. Experienced upper management team that has vast industry experience. Ethical, reliable, stable pharmacies that make up and support a long term business model. Products that quickly reimburse resulting in what we believe to be the shortest pay cycle in this industry. All of the PBM pharmacies are vetted by upper management to insure all key factors are in place for long term success for all parties involved. This is critical; to have a knowledgeable, industry seasoned team developing the infrastructure, so that marketers can work worry free and know there will be a home that guarantees payment. Factor #1 - We seek PBM contracts that aren’t under stress, that have not participated in targeting large amounts of Tricare/Medicare, creating heavy government scrutiny, avoiding the risk of being shut down like so many other pharmacies. Factor #2 - Financial solvency when so many are closing the doors and shutting down. Factor #3 - Financial stability to pay within 14-19 days and keep profitable products on the shelf. Factor #4 - Pharmacies are being vetted and signed up daily nationwide, to accommodate for the federal and PBM mandates that will be handed down making single pharmacies who operate in 50 States, obsolete. What Has Been Wrong With The Industry? And Why Is There A Need For a PBM? Because of widespread abuse to the health care system by unethical marketers, who allegedly were fraudulently promoting compounded medication, using questionable tactics, insurance companies have almost completely quit paying for topical medications created from bulk chemicals. If you are out there targeting group and bin numbers, we urge caution and advise you that you receive legal advice on this: there could be legal consequences moving forward. 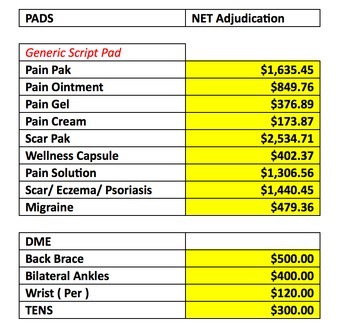 Under siege insurance companies have quit covering these much needed medications due the outrageous adjudication payouts. This fact, coupled with the massive influx of prescriptions generated by marketers over the last two years have put a huge dent in the bottom line of PBM’s like ESI, BCBS, Caremark, Medco etc., causing them to quit paying for compounded medication. There are published news reports that many of the high revenue pharmacies, the ones that marketers were dealing with - have been targeted by regulators and authorities. Between that, low reimbursement and higher product costs, many are closing their doors. Besides the insurance companies being abused, the doctors and patients suffered just as much because there were many instances where patients flat out did not receive their medications because of questionable activities at unscrupulous pharmacies trying to make a quick buck. This then left doctors being perceived negatively by their patients because they prescribed medication via that pharmacy of their choice, thus straining the doctor patient relationship and creating potential conflicts of interest. Do you really want to sign on to a continuation of even more uncertainty? Do you only want to operate in the tight knit compounding pharmacy arena where the pharmacy is in control, or do you want to control your destiny by marketing many products to many physician disciplines so as there is no limit on income? We have the answer to all this, and it is going to be a great long term solution. It’s time to make topical medication great again!! The PBM and the Compounding Group have teamed up to create a stable, solid and long term business model for pharma reps to work within that is here to last. PBM and the Compounding Group bring to the table at least 8 industry veterans who have seen and dealt with almost every variation of the compound industry from the typical brick and mortar rep to doctor model, ethical pharmacy advocate to patient, telemedicine and call centers. By dealing with every referral generation model and consulting for over 50 pharmacies over the last 4 years, our team understands the inner most workings of the industry so you can rest assured you will be working with ethical professionals vs. fly by night pharmacy owners looking to make a quick dollar. We have heard the complaints from reps, seen the widespread abuse to the system and experienced almost every scenario in this industry. We have always been honest, ethical and compliant in our dealings. It is our mission to create something that everyone can feel good about including the pharmacy owner, the rep, the doctor and most importantly the patient. The uniqueness of this opportunity is a combination of all of us, ethical industry veterans, attracting other ethical industry veterans, coming together at the right time in this business to pick up the pieces and create the leading model. We are excited to team up with other like - minded professionals who want to enter a profitable, sustainable business model for years to come. We are eager to learn from the new partners that we bring onboard and feel that our strategic vision will be of great benefit to those that join us as we all succeed together. The major factor the PBM offers more than any other particular pharmacy or rep group is a Guarantee! 1. They Guarantee that payment will be made! 2. Why? Because The PBM is very solvent! 3. Pharmacies who service our patients pay the PBM because they respect the entity. Ask any pharmacy if they have a contract with a PBM to make payments, if they will consider NOT Paying them? 5. PBM handles DME/Pharmacogenetics testing that can greatly improve the patient management model and increase revenue per patient. PBM’s are big business - totaling in the billions of dollars in revenue. Since they have been around since the 70’s, they are respected by physicians and all sectors of the Health Care community. Not a new concept. What is new, is the entering into the arena of specifically marketing to patients with pain and related ailments that were typically the domain of compounding pharmacies. From the pharmacy side there are less barriers to entry with the introduction of FDA approved products. Ethics aren’t compromised. Finally, patients with pain can truly get their medications on time and all entities involved in the vertical channel of distribution can get fairly compensated by bringing this service to the market. This is a revolution that is here to stay. It is already proven. It is the only format out there to build a long lasting carrier with. Come Join Us In Our Journey To Excellence! In conclusion, yes, there are FDA products available, there is software, there are multi pharmacy networks, But, there is only one PBM entity operating a pharmacy marketing program to compounding pharmacies reps, rep groups and pharma reps.
Do You Know About These Industry Changes? There are significant changes taking place that are not being factually talked about. It is important to know what these changes are, so that you don’t pour your heart and soul into another pharmacy and then possibly be set up for another bad experience. Reps and rep groups will no longer be able to be paid 1099 by pharmacies directly due to alleged abuse of the system fueled by fee splitting on excessively high adjudication rates. It has been contractually written into most of the individual pharmacy contracts now by many providers. Individual pharmacy contracts have been cancelled for this reason. therefore, rep pay outside PBM structure is never guaranteed. No more government scripts paid by pharmacy to reps. Please see PDF download Anti-Kickback/Stark PDF. Yes, pharmacies will still pay you, but if you read the law clearly, there is a chance you could be litigated against. Why go there, when there is a good, clean, long-term model to plug into. Interstate shipping rules and regulation to come will eventually eliminate large individual pharmacies as national processing centers… see PDF download attachment and read link below……. For those who act quickly and get back into their physicians’ offices, or ramp their call centers again, this will be the new GOLD RUSH. We feel that every savvy and entrepreneurially spirited pharma rep out there will eventually see that there has been a void left in this industry and now is the time to capitalize on it. If you are a pharma rep and tired of being limited to pushing your own proprietary drug, i.e. Viagra, and want to get a piece of the action of all the physicians medications (topical, oral etc. ), not just those targeted to pain and skin condition patients, then this is your opportunity. If all of what we have covered here sounds like something you want to be a part of, then reach out to us today. Adding the PBM medical opportunity has tremendous potential for a long term and sustainable profit center for you for years to come.